As of today, WebUrbanist has 110,378 subscribed readers from around the world – in addition to everyone else who visits regularly and follows us via our new Twitter profile and Facebook group. This is nothing short of amazing – to us at least. What started as a pet project by one person has grown into a global art, design and culture publication with multiple authors and an ever-evolving approach to creating original content. Thank you all for helping making WebUrbanist what it is today. So, what is new in the world of Webist Media? Stephanie Rogers remains our go-to gal for everything under the sun – and switch-hitter going back and forth between WebUrbanist and its sibling site: WebEcoist. We have recently had our resident technologist, Steve Levenstein, covering radical retrofuturistic technologies as well as the evolution of all kinds of technology. Gerri Elder is the newest addition to the Webist fold and has written some awesome articles collecting everything from wine label designs to vintage movie posters. Kurt Kohlstedt, the original WebUrbanist author, still pipes in now and again with a geekalicious article on whatever he is stuck on at the moment. Speaking of WebEcoist, the green sister site of WebUrbanist, we have new authors covering content that continues to range from entertaining to educational. 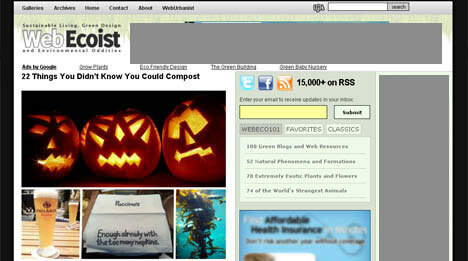 Some articles contain practical tips on home gardening, air purification and brilliant bio-fuels. Others err on the side of the extraordinary, spectacular and unusual, such as the seven wonders series, natural phenomena and formations, elemental forces and disasters and exotic plants and strange animals. If you are a regular reader and enjoy WebUrbanist be sure to check out WebEcoist and sign up for the feed. Some of you will have no doubt noticed links to the latest venture by Kurt, founder and lead editor of Webist Media: Dornob Design. For those of you not familiar, Kurt has an undergraduate degree in philosophy and a graduate degree in architecture and urban design. WebUrbanist has been his passion for nearly two years but he also has felt the need to launch a new venture more directly tied to his original interest in the designed spaces and objects. 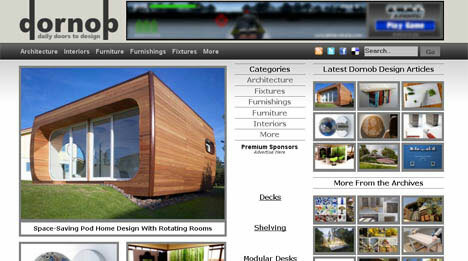 The site has already been mentioned in such publications as BoingBoing, Gizmodo and the Huffington Post. 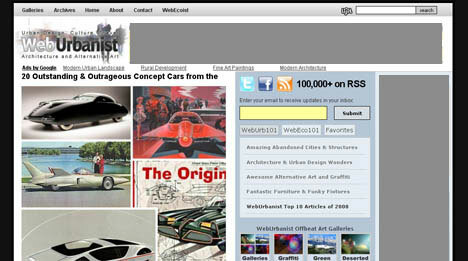 While WebUrbanist also covers a great deal of art and design, Dornob is more specifically focused on architecture, interiors, furniture, furnishings and fixtures – but of course contains a catch-all “more designs” category for offbeat gadgets, funky fashions and artistic designs that simply refuse to fit into a single conventional category. If you have not yet done so, feel free to browse the categories on Dornob, sign up for the feed or newsletter, join the Facebook group and follow the site on Twitter. We hope in particular you have enjoyed the ways in which WebUrbanist has grown and diversified over time, bringing in new voices and introducing new directions to keep things interesting without (we hope) losing our core focus on creating fantastic content. As always, thanks for following us on the strange paths we take and for all your support through subscriptions, comments, feedback and sharing links to our content with your friends along the way. In short: that you, once again, for reading WebUrbanist and be sure to visit WebEcoist and Dornob Design as well.